Posted August 2, 2017 by admin & filed under Featured Inner West Independent, Inner West Independent. Four months into a highly awaited round of campaigning, candidates of the Inner West Council’s Stanmore ward are vying to take the helm of one of Sydney’s most vibrant communities. With the election just weeks away, the battle is tipped to be a game-changer for the area. Political heavyweights, the Greens and Labor, are forecast to have an upper hand in the September 9 election, where three candidates will be selected for each ward. Ben Raue, an election analyst at the Tally Room, said that the Inner West Council area, encompassing Haberfield, Ashfield, Lilyfield, Leichhardt, Dulwich Hill, Marrickville, Sydenham, St Peters, Enmore, Stanmore and Lewisham, has previously trended towards the Greens. “The Stanmore ward elected two Greens in 2004 and 2008, and then that second Green was replaced by a Liberal in 2012. Before that, the area, like all of Marrickville, was dominated by Labor. As to why, the Stanmore area is the epicentre of the progressive inner city community that first developed in areas like Newtown and has expanded further out,” he said. Previous election forecasts have speculated that the Greens and Independents would struggle under redrawn boundaries, after candidates faced a tense pre-selection battle, with the original councils taking on 36 councillors, 25 more than the redrawn council. But according to Mr Raue, the Greens and Labor will continue to have a stronghold despite the about-face. “Labor and the Greens should comfortably win one seat each. Both parties poll well over 25% in the ward at all levels of government, and so it’s fairly certain they will win the first two seats. The third seat could go to either Labor or Greens, or progressive independent Pauline Lockie,” he said. The redrawn council areas will see candidates managing a mammoth council area and a budget of hundreds of millions, after the once separate councils were merged just over a year ago. Pauline Lockie, an Independent candidate for the Stanmore ward, said the amalgamation would not shift the progressive swing of the ward. “If anything, I think there’ll be a shift towards stronger representation of the community’s voice and values, which is why I’m standing. I’ve already got a strong track record of defending and supporting the interests of my community. I think that’s what people want of their local representatives, and this is my commitment to them,” she said. Candidates have high hopes for Stanmore, hoping to usher in a new era of change after sweeping reforms of the council boundaries shook up the council area. 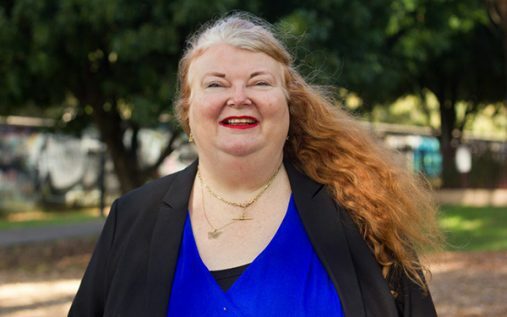 Greens candidate for the Stanmore ward, Louise Steer, is set to continue to show fervent opposition to Westconnex. Ms Steer is also set to rally to restore democracy to the community, which has been governed by an administrator for the past 18 months. “[The Greens are] committed to finding beneficial solutions to the affordable housing problem in the inner west, preserving local green spaces, and protecting the community against the destructive Westconnex toll road project. “The Greens are also committed to holding a plebiscite after the local council election asking voters whether they would like to de-amalgamate Inner West Council and reinstate the former local councils of Marrickville, Ashfield and Leichhardt,” she said. Ms Lockie has also been campaigning against the Westconnex development, a concern which she says is one of the most pressing issues in the area. “If people vote for me, I promise to keep fighting for our community against WestConnex, just as I have already been doing as a founding member of the WestCONnex Action Group. I’ll push for increased childcare and public school places. “I’ll also be campaigning for better active and public transport, and for greater transparency and community involvement in planning processes. I’ll work with small businesses, artists and creatives, and local organisations to keep our unique inner west industries thriving,” she said. Labor candidate, Anna York, is campaigning for strong social and cultural services in the area, with a focus on support for working parents, improving public infrastructure, making the area accessible, advocating sustainability and fighting bus privatisation and Westconnex. “Diversity, community and inclusion are the cornerstones of our identity in the Inner West. As the mum of a toddler, Council-run children’s services such as the Magic Yellow Bus… have been a huge part of my experience of parenthood… Services like these are possible because Labor activists and Councillors have worked over decades in our community to make them a reality,” she said. According to Mr Raue, the winner of the third seat could completely shift the political allegiance of the ward. “The interesting issue will be who can win the third seat. The former Marrickville council was effectively governed by a Labor-conservative alliance, with the Greens struggling to find allies. If Pauline Lockie wins the third seat she could prove to be an ally and help the Greens form a governing majority,” he said. With just weeks to go until the election, candidates are demanding action as Premier Gladys Berejiklian scraps outstanding council amalgamations across Sydney, sparking a backlash in the Inner West.